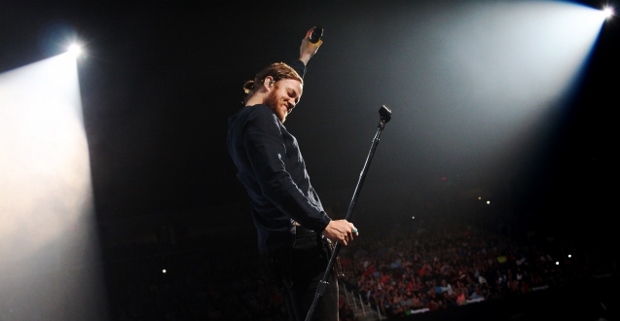 Under The Gun Review sent photographer Kellie Gannon to Quicken Loans Area in Cleveland, OH to shoot Imagine Dragons on June 22. Recently, Quicken Loans Arena in Cleveland saw a whole lot of action, or lack thereof if we’re considering the Cavs during NBA Finals (just like every other year, next year is our year… seriously… maybe… COME ON, LEBRON!) Anyway, on a humid, rainy night less than a week after that final fateful basketball game, The Q was thankfully rocking to a much different, upbeat tune. Hailing from Vegas and putting on a Sin City-worthy show, Imagine Dragons have been making waves in the music industry for a few years now. They formed six years ago and were catapulted into the limelight in 2012 with their heavy-hitting, radio friendly debut album, Night Visions. Having quite a few large tours and festivals under their belt in such a short time, they are no stranger to filling large venues and putting on larger than life stage shows. This current arena tour, in support of their sophomore album, Smoke + Mirrors, is exactly what Imagine Dragons fans have been waiting in anticipation for. Direct support on the tour came from Halsey and Metric, both incredible acts in their own right. Young, blue-haired rocker chick Halsey jump-started the night with a handful of her catchy, dark tunes and Metric’s infectious energy got the crowd on their feet and eager for Imagine Dragons. Check out Imagine Dragons in a city near you and enjoy the photos from this wild, energetic show!